Revealing a surprise to your children like a trip to Disney or a new swimming pool is one of the most enjoyable parts of being a parent. And for anyone that has had to share less enjoyable news, maybe the death of a family pet, you soon realize this is one of the hardest parts. As thrilled as Tony and I were for this next chapter of our family’s life, relocating to Barcelona, I was worried sick about telling the kids. When our realtor asked to stake a “For Sale” sign on the front lawn, we told her no! Who does that? We wanted to avoid the kids raising questions – especially from our five-year old, who notices EVERY-thing including when the neighbors came home with a rental car after an auto accident. Plainly put, he keeps us on our toes! To us, our move was exciting news. To Anthony and Autumn, I wasn’t so sure. How would we even deliver the news?! “Hey kids, Mommy and Daddy have made a decision that will completely turn your lives upside down and guess what? You’re just along for the ride.” Ugh, the butterflies seemed to be eating away at the lining in my stomach. Would we break their little hearts? I prayed they wouldn’t cry or worse…hate us forever. A week after our relocation decision was made, I was attending my son Anthony’s nursery school Mothers’ Day Tea. This was my absolute favorite event of the year. Each mommy received a bouquet of paper tulips with sugar gumdrops inside (although three of my four gumdrops already had all the sugar licked off, ahem), a hand-print craft (which as fellow moms know, are worth more than a pair of red-soled Louboutins!) and were served sprinkle cookies with iced tea. The class performed skits and upbeat songs while the moms exchanged humble smiles and giggles to one another. And then his teacher cued up the music to one last tune. A sweet melody called “Count on Me” by Bruno Mars. Suddenly my brain was filled with memories and my eyes filled with tears. Warm baby snuggles, stumbling first steps, nighttime feedings, first words and countless other milestones that get documented in the baby book but soon forgotten during the tumultuous and trying toddler years. “If you ever find yourself stuck in the middle of the sea…I’ll sail the world…to find you. And something inside told me exactly what my little boy and his sisters needed to hear from their Mommy and Daddy. Several weeks later after school was out for the summer, we felt the time was right. Still unsure of how both Anthony and Autumn might react, we decided to tell them separately. Allow them to feel honest emotion without influence from the other. This was the right move. My daughter, who is bouncy, chatty, funny and fearless responded with a simple, “Well…..I really like our house. Can I take my room with me…like, all of these walls! ?” To that, we giggled with relief and responded yes. “Can I take my dollhouse with me?” And the list went on of her personal belongings and the reassurance she needed that it would all come with us. Sigh* That went well! But she was the easy one to share the news with and Tony and I both knew it. When it was time for Anthony, we chose a quiet part of the house free of interruption. I handed him a gift bag, similar to one also prepared for his sisters. Excitedly, as all five-year olds would do, he tore through the tissue paper and pulled out a hat. On the front was the symbol for FCB (Futbol Club Barcelona for our American football friends!) Next was a framed photo of our family. And last, a book titled Undercover Spy Adventures in Barcelona. “Well, Mommy and Daddy are very excited to tell you about a new very special adventure. And the best part is that we get to do it all together as a family!” Anthony’s eyes were wide now. “We are going to be moving to another part of the world in Spain to a city called,” and he grabbed the book, “Barcelona.” And there was a pause. I would love to end this post on a real high and tell you that Anthony jumped for joy at our news! Truth is, he didn’t. He threw his head back, put his hands over his face and started to cry. His first words were, “I don’t want to move! I like it here!” Tony and I looked at one another and I’ll admit, I was useless at that moment. None of the responses I rehearsed in my mind could find their way to my mouth. Luckily, Tony had comforting words about all the exciting things this new adventure would bring. Then he did something that I have such a hard time with as a mom. He took my hand and motioned for us to walk away. Leave Anthony on the couch to thumb through his new book and allow him to really process the news. As difficult as this was for me, I agreed it was the very best move. Sometimes as parents, we just need to stop talking. Stop comforting. Stop explaining. And let our children navigate their own emotions. An hour later, I was in the kitchen washing dishes. I felt a little hand tap me on the leg and I turned to see my son standing there. “Mommy?” he asked. “Yes sweetheart,” I answered. And the part that came next I will never forget. My five-year old said in a quiet voice to me, “I am sorry for being so sad before with you and Daddy. I am excited about Barcelona!” I had a golf ball in my throat at that moment but said nothing. Just squeezed him hard. For a long time. Thin threads in life always seem to amaze me. This next one gives me chills. 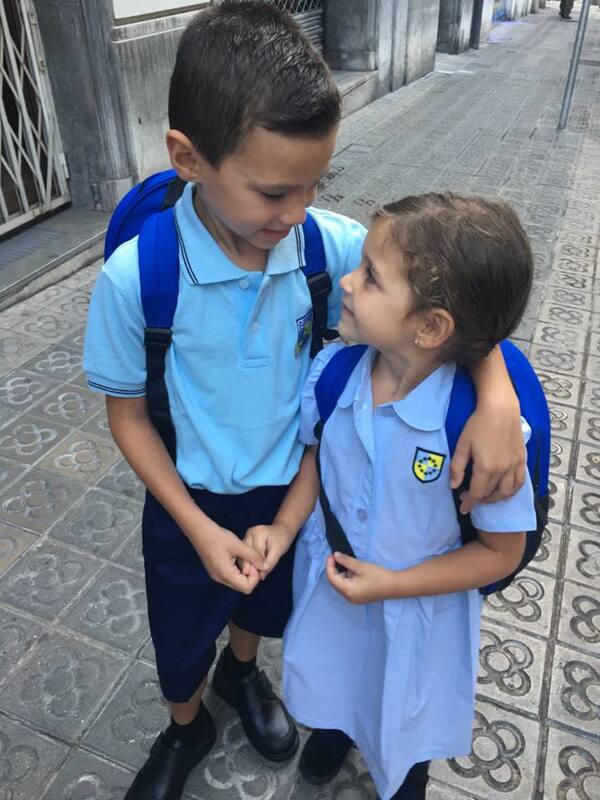 The entire first year of school in Spain has come to an end for my children and to celebrate the occasion, Anthony’s class performed a Summer Show. Had it really been one year since that special Mothers’ Day Tea? So much had changed since then. My once little boy was now one of the tallest in his class! And then to my utter amazement, his teacher cued up the music to one last song and I couldn’t believe my ears. The same familiar tune sang just one year earlier began to play. “If you ever find yourself stuck in the middle of the sea…” As Anthony’s class, filled with the faces of students from all over the world who were complete strangers only twelve months ago, started singing, I looked at my son with tears in my eyes. And in my heart, I knew the initial pain was worth this ultimate reward. The adventure for our family had really just begun. What a beautiful story. While hubby and I have never gone outside of NY (while married) before meeting I spent time in Spain and if I would ever live anywhere else, it would be my choice. This blog hit home as my son and his family recently moved to Hong Kong and even though we Skype, I do miss them so much, especially my grandsons age 6 and 3….but I found children are resilient and they have adapted already and while there are learning Mandarin – it will be a great experience for them. Enjoy the adventure.